This year will be my 3rd Mother’s Day and I swear, every year I get more and more excited for it. My first year was so surreal- Luke was maybe 2.5 months old and I hadn’t really settled into the new Mama boots yet. It was still a little weird to be called the word and then here came this day where it was all about me being it! For 30 something years prior, each Mother’s Day was about showering and loving on MY mom…and now here I was the Mom! Then last year I was a little more settled into the new role and extremely excited. I had Mothered this little guy for over a year and I sort of felt like I earned that day! I was ready for it! Shower me! Love on me! Tell me how wonderful of a Mama I am! Hahahaha. Give me all the kisses and hugs and praise (and chocolate doesn’t hurt!) Mamas need that, really. We all work so hard all year long to selflessly love, care, protect, and raise our littles- its definitely a well deserved day. If you’re looking for a really easy way to show your Mamacita some pampering, I’ve got something that’s going to really start her day off in the right direction. It starts with three words: Breakfast in Bed. Let the girl sleep in! Grab those babies, dads, take them to the other side of the house (or better yet, go out and get her favorite coffee!) 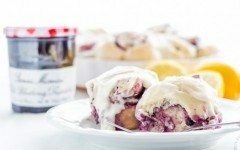 and then make her this breakfast to enjoy while still snuggled up in those comfy sheets (and let her favorite people help too! #bonuspoints). Heads up, it does take a little bit of night-before prep, but it’s so easy that you can do it minutes before you hit the hay. 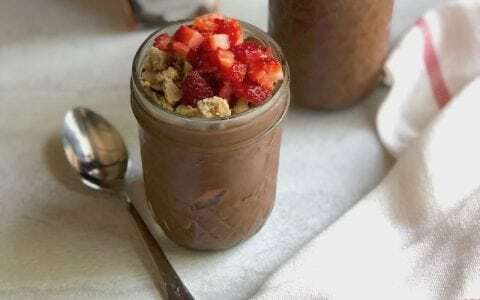 This Mother’s Day Chia Parfait has the perfect amount of dessert-like qualities balanced with ingredients that are super beneficial for your sleeping beauty’s body. Chia seeds: these puppies contain omega-3 essential fatty acids, complete protein (including all essential amino acids), fiber, iron, calcium, potassium, and more! Full fat coconut milk: coconut milk is lactose-free, rich in fiber, vitamins, minerals and gives a dose of good healthy fats! Raw cashew butter: rich in unsaturated fatty acids, a great plant-based protein, high in dietary fiber and minerals like copper, zinc and magnesium. And secret, secret: there’s a little pop of lemon in one of the layers that really brings a whole new element to this dish! I took a chance with that element, and to be honest was a little nervous it wouldn’t work. Guys, it so did. It compliments the vanilla, cashew and strawberry flavors so well. 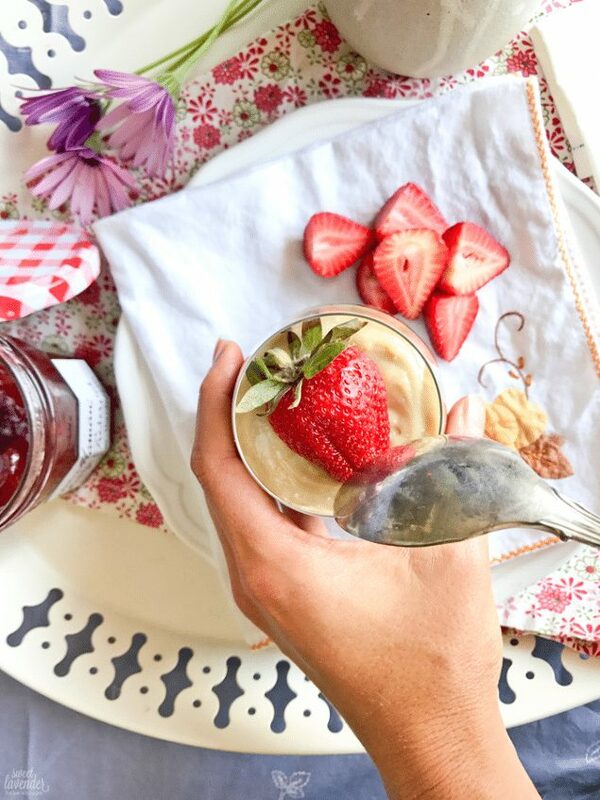 Speaking of strawberry, there’s the most magical layer of Bonne Maman Strawberry Preserves in-between two layers of lemon cashew butter and vanilla chia seed pudding. One bite of all three layers does this symphony in your mouth! 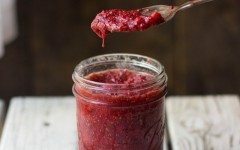 What I love the most about these preserves is they’re just like homemade, so they blend in really well with the other two layers that are indeed actually homemade! The ingredients in the preserves are so simple and natural- you know you’re keeping an amazing quality dish here. Mamas need that sort of pampering, guys. Plus, Bonne Maman never uses high fructose corn syrups or additives, they are Non-GMO verified, OU Kosher and gluten-free (when applicable). Having Hashimotos’ this gluten-free ness is everything. I need to make sure each aspect of everything I eat is gluten free. 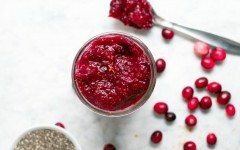 Now these preserves are not sugar free in any sense of the word, so this dish is not Paleo. But for a special day like Mother’s Day, I let things like that slide a little. It’s what gives this dish it’s “dessert-like” quality. 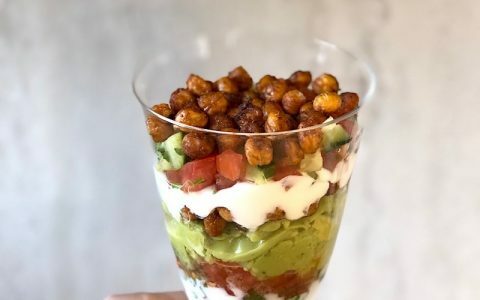 This dish is still dairy, grain and gluten free which is a win in my book. It’s the perfect balance of sweet because I’ve kept the other two layers pretty darn low on the sugar factor. 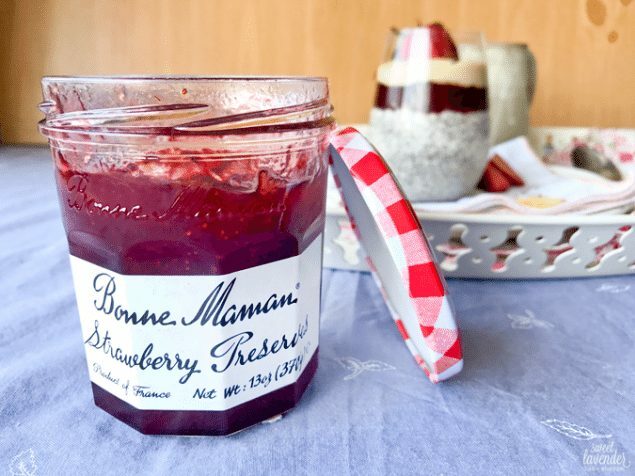 Bonne Maman’s primary goal is to make amazing products and they are obsessed with product quality; you can really taste that in these strawberry preserves. It tastes like something your grandma would have made in her own kitchen (psssssst: did you know “Bonne Maman” actually means “grandmother”???) “Simple ingredients, homemade taste” is what they’re all about. The night before, make the chia seed pudding. In a medium sized bowl, mix together the coconut milk, maple syrup and vanilla extract. If your coconut milk has separated the fat from the water, make sure to incorporate it really well before using. I do this by blending up the contents of the entire can in a blender, then measuring out amount I need. The morning of, make your lemon cashew butter. In another medium sized bowl, whisk together the cashew butter, vanilla extract, fresh lemon zest and coconut milk. Set aside. 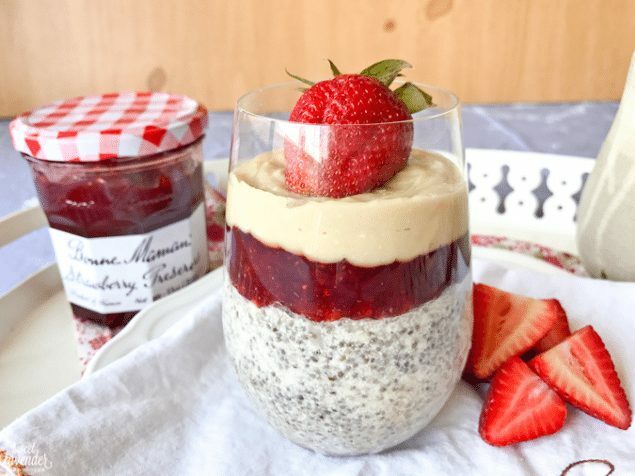 Remove chia pudding from the fridge, smooth out layer so that it's flat, if needed, and carefully spoon 3 tablespoons of Bonne Maman Strawberry Preserves over the pudding. With the back of a spoon, carefully spread out preserve layer so that it's as flat as can be without going into the pudding layer. Next, carefully spoon the cashew butter into a sandwich sized ziplock bag, cut the corner with scissors, and squeeze the butter into one corner, making a make-shift piping bag. Squeeze butter over the top of the preserves and smooth that layer so that it fills in all gaps and forms a smooth top. If using, carefully place a fresh organic strawberry on top, or cut up alongside. 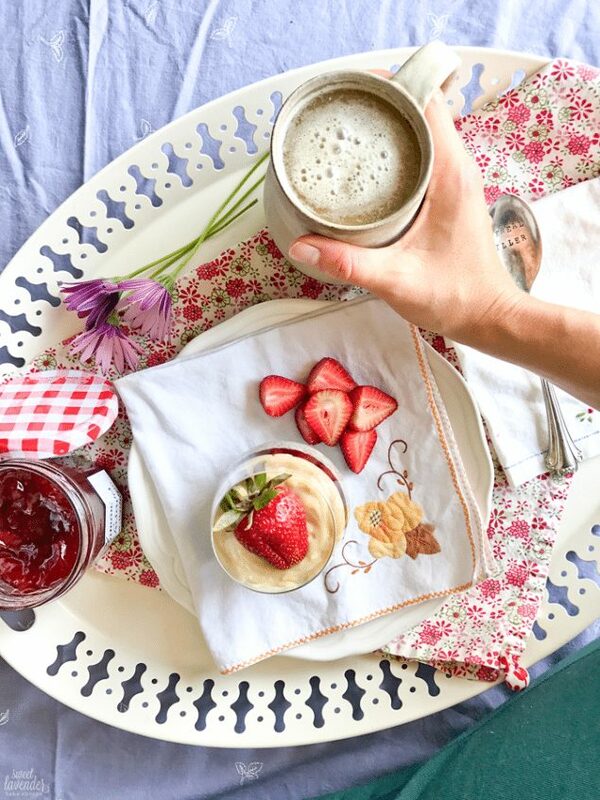 Pour her favorite morning beverage, grab the kiddos, and serve that mama her deserved breakfast in bed. Christina Main is the creator of Sweet Lavender Bake Shoppe, but more importantly, is a sinner who has been graciously and mercifully saved from death, through the life and selfless sacrifice of Jesus Christ. Her story is a story of true redemption. She whole heartedly believe in the Bible, believes it to be completely inerrant, living and God's breathed Word. She believes in the Father, the Son, and the Holy Spirit. Although a wretched and sinful person, through His sovereign grace, she's able to strive to follow His Word daily. She knows that without Him, she couldn't do a darn thing. I would appreciate this recipe please, thank you.